As moms, we know that no matter what lunch we prepare for our kids, they always seem to want to swap sandwiches with their friends once they get to the cafeteria at school! When it comes to the time-honored tradition of swapping sandwiches, our kids may be having all the fun. Luckily, Hellmann's® and Best Foods® Mayonnaise has teamed up with musician and actor Billy Ray Cyrus to encourage people of all ages to celebrate their favorite childhood ritual and join the virtual Sandwich Swap 'n' Share program to raise money for Feeding America®, the nation's leading domestic hunger-relief charity. 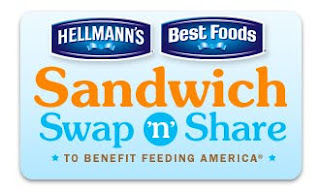 For every sandwich created as part of the virtual Sandwich Swap 'n' Share program on Facebook.com/hellmanns, Hellmann's® and Best Foods® will donate 7 lunches to Feeding America®. 7 lunches equals a $1 donation Hellmann's® will make to Feeding America® to provide meals to Americans at risk of hunger. Up to 700,000 lunches. No purchase necessary. Void where prohibited. Sandwich Swap 'n' Share Sweepstakes is sponsored by Conopco, Inc., d/b/a Unilever. Open to legal residents of the 50 U.S. & D.C., 18 & older. Begins 12:00:01 p.m. ET on 8/19/09 & ends 11:59:59 a.m. ET on 10/30/09. For official rules, visit the Hellmann's® page at www.facebook.com/hellmanns or www.facebook.com/bestfoods. So what are you waiting for? Head over there and make a difference.